I’m slightly embarrassed to admit that I only made it to one winery during my Californian adventure. But! I made up for it by going to a pretty special one. We stayed two days in Napa for a wedding and on our way out of town my aunt and I stopped in at Grgich Hills Estate Winery. Don’t know about Grgich? Don’t worry, besides vaguely recognizing the labels I didn’t either. My only frame of reference was having it once or twice with my parents and feeling like it was a fancy (read: expensive) California wine. I soon learned when I got there is that Mike Grgich, the man who started Grgich winery, is pretty much California wine royalty. Oh, hey Mike, nice to meet you! Let me take you back. The year is 1976, and this guy named Steven Spurrier decides that even though California is taking it on the chin in terms of wine discrimination, he doesn’t think the wine is all that bad. In fact, he thinks it might give French wines a run for their money. So, to test that thought, he decides to hold a blind tasting of French and California wines and has fancy-pants wine experts (all French, no less) come and taste. The whole thing becomes known as the Judgement of Paris and causes quite the upset since American wines took the top spot for both red and white wines. 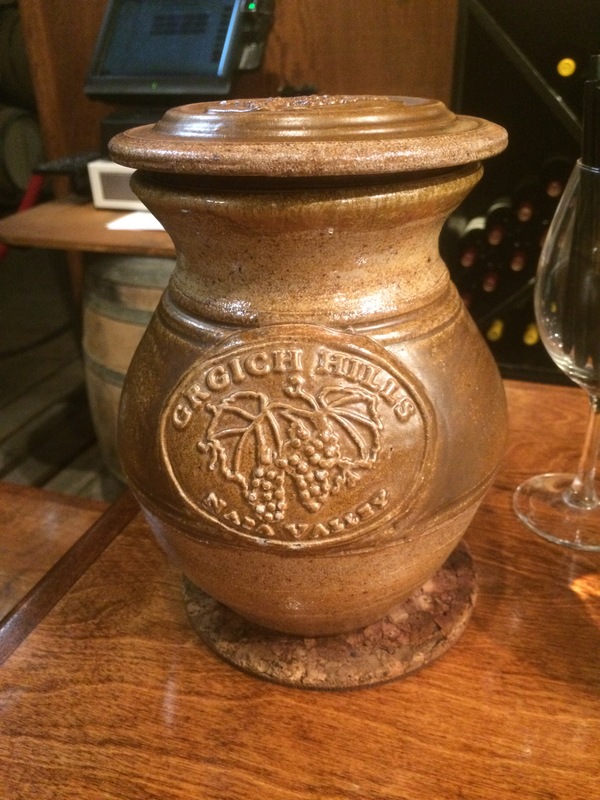 While the competition put a lot of French noses out of joint, it was also a big confidence boost for Californian wine-makers, and (in my opinion) was a watershed moment for the California wine industry. 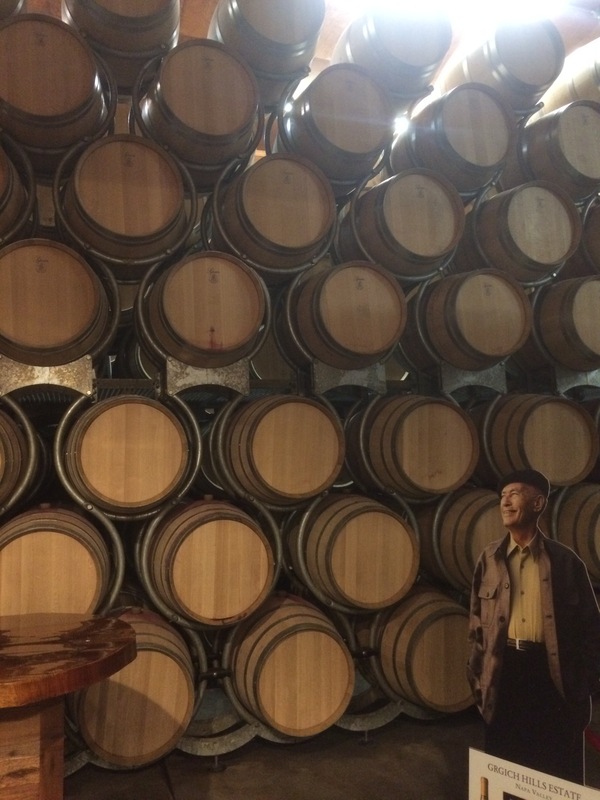 What does this have to do with Grgich Winery, you might ask? Well! 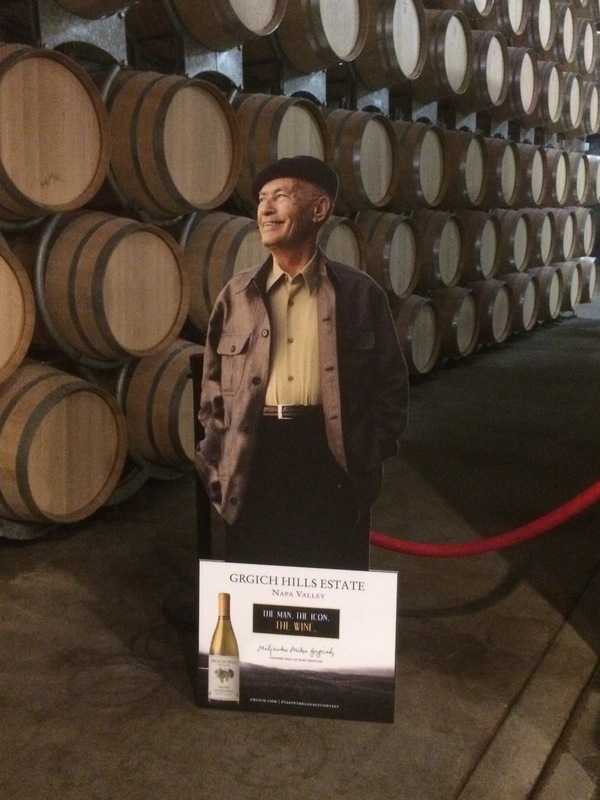 It turns out that the person who made the winning white wine, a Chateau Montelena 1973 Chardonnay, was none other than Mike Grgich. Clearly this guy knows how to make good wine. So! Back to the tasting at hand. 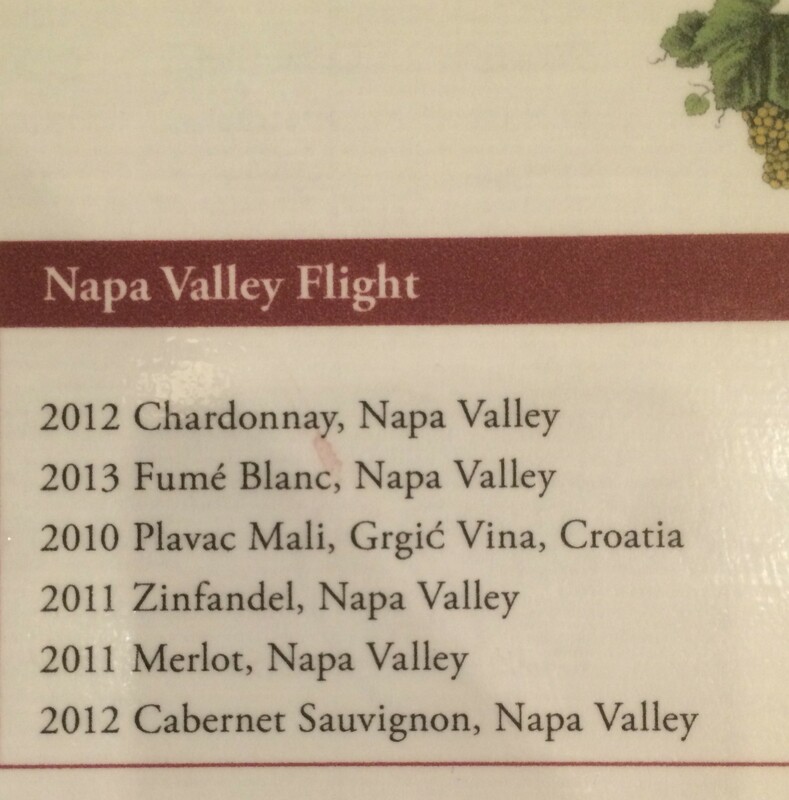 I tried their Napa Valley Flight, which consisted of six wines – three white and three red. Yep, looks like a wine list. Pretty setup, now let’s get to tasting! The Chard was solid, and tasted just like a classic California Chardonnay – full bodied, grassy, buttery, delicious. I wasn’t sure what to make of the Fumé Blanc until my wine-pouring friend told me that it’s mostly composed of Sauvignon Blanc, and that Fumé Blanc is just what California wine-makers have decided to call it. Sneaky! It was crisp and citrus-y and I loved it, which was exactly what I expected once I learned it was really a Sauv Blanc in disguise. The Plavac Mali is where things got interesting. Mike Grgich was born and raised in Croatia and has done a lot of work in the wine industry there, even while living and working in the US. This wine is actually from a winery he owns out there, and my wine-pouring friend told me that they like to include it in this tasting flight to educate people about Croatian wine and to give some history about their own winery. This wine was sharp and tangy, and had a chemical kind of flavour that I hadn’t really tasted before. If you’ve ever had Retsina, it had a similar quality. It grew on me as I drank it, but it took time to get used to because the flavour was so different from what I normally drink. Of course they have their own branded spitting bucket – what kind of shabby place do you think this is? The Zinfandel was light and smooth and confident and friendly. That might make me sound like a weirdo, but it’s true! It was really approachable, easy to sip. A great transition as I moved from the whites to the reds. The Merlot was heavenly. Medium-bodied, smooth, inviting, velvety – like easing into a hot bath after a long day. I could drink this wine every day and be happy. The Cab Sauv was the biggie of the bunch, which isn’t surprising considering Cabs are big boy grapes, and one of the jewels in the crown that is California wine. It was fuller bodied but well balanced, meaning no one flavour overpowered my taste buds. You know those people who just have effortless confidence, who can walk into a room and be well-liked by everyone? That’s what this wine was like. Thanks for the tasting, Mike! Yes yes, your barrels look lovely. 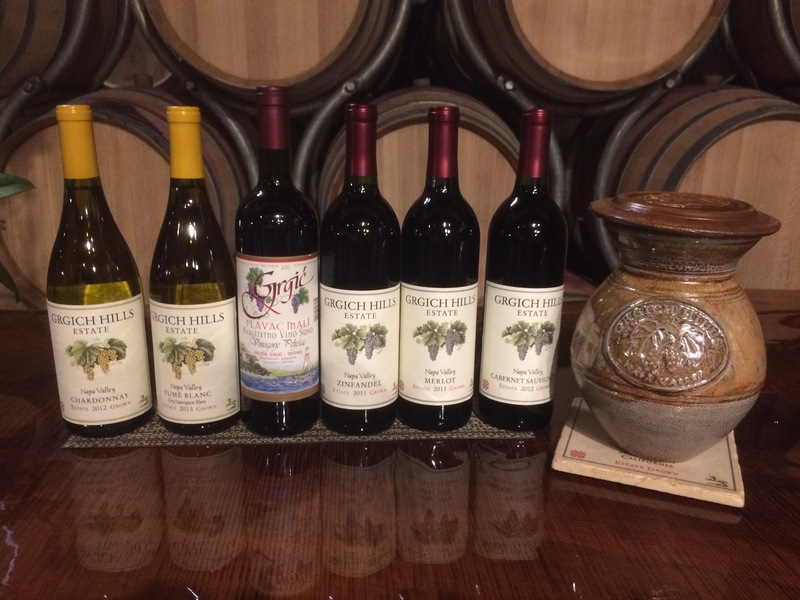 Sadly, after meeting these six wonderful wines we had to leave Napa to get on the road (to drive the coast to LA – it’s a hard life, isn’t it?) but I did take a moment to enjoy the scenery as we left. Kind of a humdrum view, don’t you think? 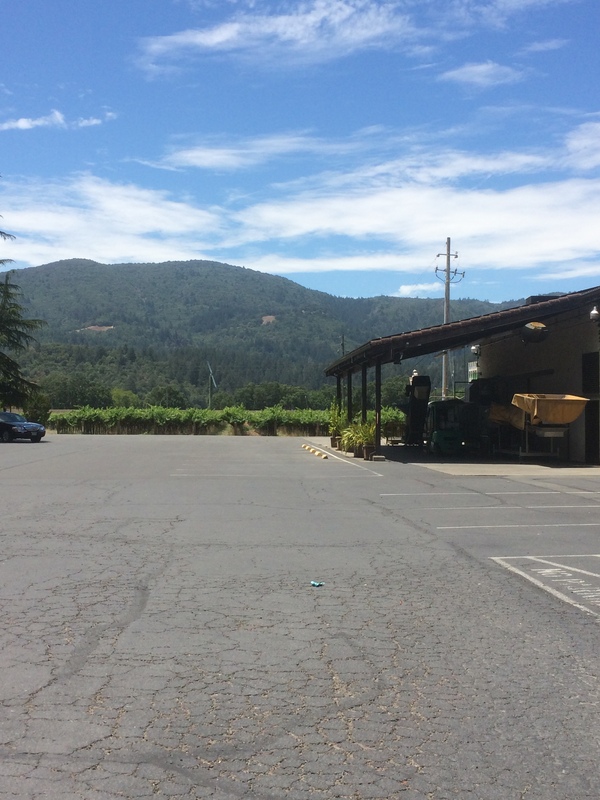 All in all, a good first visit to Napa. The only thing left to do is plan another trip. It’s Mid-August, Do You Know Where Your Rosés Are?